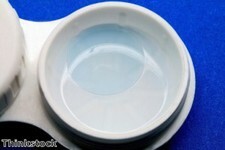 Spare contact lenses "should be carried in emergencies"
Contact lenses are one of the essentials that town chiefs are advising should be included in people's evacuation bags. The City of Edinburgh council is urging residents living in the city centre to make up a grab bag of items as part of its major incident evacuation plan, the BBC has reported. Contact lenses, glasses and medications are among the three items the council believes people should always have to hand at a moment's notice, along with house keys, cash and bank cards. The area houses an estimated 70,000 people, although this increases according to the season, and the region includes high-profile destination such as Holyrood Park, Edinburgh Castle and Carlton Hill. Dave Anderson, director of city development at the council, has told the BBC that it is important to always be prepared. He said: "Although Edinburgh has seen a number of incidents over the years, including major fires and building collapses, there has never been a widespread evacuation in the city and we hope this plan will never be required." Recent figures produced by GfK and published by Asia One have shown that the number of people using contact lenses worldwide has risen fast, with silicon hydrogel lenses being ranked among the most popular types.